Creatively preserving our heritage and recycling God's gift of nature. Discover the distinct and historic look that reclaimed wood can bring to your home, office, lodge, or church. The beauty and character of reclaimed wood is simply unmatched in the marketplace today. Reclaimed and recycled wood is a wonderful green building material that will add unique and historical character to your home or project. By reusing old wood, you will help to preserve our environment and natural resources. Reclaimed wood offers a unique look that can range from very rustic - as is evident in our Vintage Oak Barn siding - to the very clean, refined look found in our Premium grades of Antique Heart Pine. In addition to the Antique Heart Pine and Reclaimed Oak, we have added several species over the years. Our inventory of reclaimed woods includes Antique Heart Pine, Chestnut, Kentucky Poplar, Douglas Fir, Oak, Hickory, Maple, and Cypress. 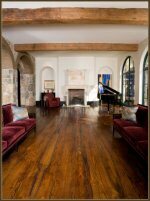 The Vintage Hardwoods are primarily reclaimed from barns and tobacco warehouses in the Midwest and Northeast regions. Our Antique Pines are salvaged along the east coast from Galveston in the south all the way up to Maine. Our craftsmen custom mill these old wood materials into reclaimed wood flooring, beams, staircases, and trusses. The Woodshop of Texas has supplied reclaimed lumber coast to coast in the United States, and has shipped recycled material overseas as well. We can export our reclaimed lumber anywhere in the world. No matter your project - whether building a new home or remodeling a house or office - reclaimed wood offers a unique and historical aspect that will be enjoyed for many years to come. Reclaimed Wood flooring can make any room feel airy and more spacious. Reclaimed Wood timbers are a magnificent choice for exposed beams and trusses. Reclaimed Wood is available in a diverse selection of colors and grain patterns. The Woodshop of Texas can provide custom milled reclaimed wood material for almost any project.